Airman charged with espionage at Guantanamo. 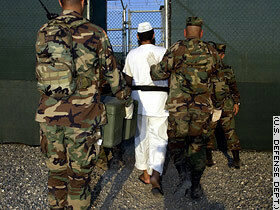 Guantanamo, CUBA(Associated Press, Photo:Reuters), |08:00, 24 September 2003|. An Air Force enlisted man who was a translator at the U.S. Navy base in Guantanamo Bay, Cuba, has been charged with espionage and aiding the enemy, Pentagon officials told CNN on Tuesday. Officials said Senior Airman Ahmad al Halabi was arrested July 23 because he allegedly had classified information about suspected al Qaeda detainees and facilities at the Guantanamo Bay base on his laptop computer. Al Halabi, an American of Syrian descent, allegedly e-mailed information that included details about the base's flight schedule to contacts in Syria, officials said. He also is believed to have smuggled notes of interviews with detainees and laptop computer files from Camp Delta -- the prison camp at the base. He is being held at Vandenberg Air Force Base in California. Al Halabi was charged with 11 counts of failing to obey a lawful general order or regulation, three counts of aiding the enemy, four counts of espionage, nine counts of making a false statement and five counts that include violations of the Federal Espionage Act. He also was charged with a single count of bank fraud. Al Halabi's home base was Travis Air Force Base in California, but he served nine months at Guantanamo Bay as a translator between the detainees and investigators. His arrest took place about seven weeks before Army Islamic chaplain Capt. James Yee was taken into custody on similar suspicions arising from his duty at Guantanamo Bay. Officials said that when Al Halabi was questioned he had no reasonable explanation for possessing the classified material. The investigation now centers on whether there was a connection between the two detained men. Officials said they have no proof of a connection. Officials also told CNN that additional arrests of other members of the U.S. military are possible shortly. Yee, who has not been charged, is being held in the stockade in Charleston, South Carolina, on suspicion of espionage and treason. Military authorities took him into custody September 10 at the naval air station in Jacksonville, Florida, while he was in possession of classified documents "that a chaplain shouldn't have," said an official who spoke on condition of anonymity. The official said the documents included "diagrams of the cells and the facilities at Guantanamo," where the military is holding about 600 suspected al Qaeda members and others termed enemy combatants. In addition, Yee is suspected of having ties to radical Muslims in the United States who are under investigation, the official said, adding that he couldn't elaborate.